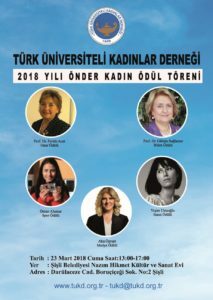 Turkish Association of University Women (TAUW) has been organizing Leading Women Awards ceremony since 2008 as a traditional event for International Women’s Day. This year on March 23, TAUW has given awards to women who have worked for improvement of women’s status, have been a role model for women and represented TURKEY successfully. Congratulations to all of them and thank you for sharing with us this news, GÜLBİN Tarim! The Honor Award goes to Prof.Dr. Feride ACAR Governor of GREVIO, the Science Award goes to Prof. Dr. Gülsün Sağlamer who is the first women president of Istanbul Technical University ( ITU) and the President of European Women Rectors Association ( EWORA). The Media Award goes to Ahu Özyurt . She is a successful TV program producer and narrator highlighting the issues about women’s status. The Sports Award goes to Öznur Alumur . Öznur is Turkey’s visually impaired national athlete at the age of 21 who wined many medals and also is a university student. The Art Award goes to Yeşim Ustaoğlu who has recently directed the film “Clair-Obscur” telling about the lives of two women in a patriarchal society in which one of them is a psychiatrist trying to cure a child bride.